FOR PEOPLE ON THE GO. FOR PEOPLE WHO MAKE THEIR MINUTES COUNT. Now Complete In 14 Volumes! Even if you have a regular learning program, A Daily Dose will add more learning and excitement to your day - every day! Each hardcover, beautiful volume of Daily Dose will provide four weeks of provocative and enjoyable learning. 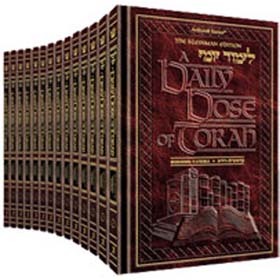 Over the course of the coming year, ArtScroll plans to publish the initial cycle of this series in thirteen four-week volumes - plus a fourteenth volume focusing on the Festivals. Each new volume will be released in time. All in 18 minutes a day!